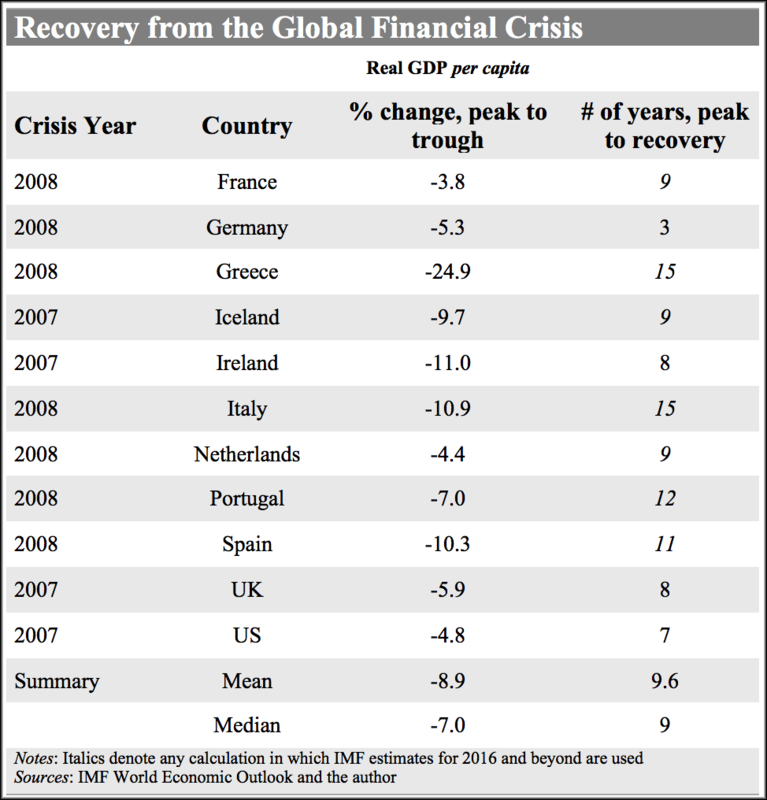 Scooper - Technology News: "The anemic recovery in advanced economies:" Are we ignoring a major cause? "The anemic recovery in advanced economies:" Are we ignoring a major cause? The meeting of G-20 finance ministers and central bank governors in Washington, DC last week concluded on a sour note. Small wonder: Global growth prospects have dimmed amid a variety of risks now emanating from both advanced and developing countries. The meeting’s participants addressed – yet again – the need for greater policy coordination, more fiscal stimulus, and a variety of structural reforms. And that discussion has become more urgent, given the widespread view that monetary policy may not have much ammunition left, and that competitive devaluations would do more harm than good. But with the largest economies, nearly eight years after the global financial crisis, burdened by high and rising levels of public and private debts, it is baffling that comprehensive restructuring does not figure prominently among the menu of policy options. Indeed, for the global economy, debt restructuring is the proverbial elephant in the room. In the early stages of the financial crisis of 2008-2009, Kenneth Rogoff and I noted that recovery from severe financial crises are protracted affairs, as it takes time for households and firms to work down the debts accumulated during the boom. At the same time, banks, faced with a surge in nonperforming loans and compromised balance sheets, may be unable or hesitant to engage in new lending. Delays in cleaning up balance sheets are among the factors that impede recovery and make post-crisis recoveries different from typically sharper business-cycle rebounds. In a follow-up study , we documented the trajectory of per capita income following the 100 worst financial crises since the 1860s. We found that it took a little more than seven years, on average, for the advanced economies (as they are defined today) to reach the pre-crisis level of income; the median recovery took about six years. The decline in per capita income from its peak at the onset of the crisis to its trough at the recession’s bottom averaged about 9.6% for this group. Crisis-related output collapses for emerging markets were worse. How does the modern post-crisis experience compare to its historical counterparts? The International Monetary Fund’s latest World Economic Outlook , which offers projections for per capita GDP growth (among numerous other indicators) through 2021 for most of the world’s economies, facilitates the appraisal. France, Germany, Greece, Iceland, Ireland, Italy, Netherlands, Portugal, Spain, the United Kingdom, and the United States all had systemic financial crises. Two of the 11 (Germany and the US) had a shorter road to recovery than the historical experience for the advanced economies. Ireland and the UK are next in recouping lost income (see table). If the IMF projections are taken at face value, the median time it takes to reach the pre-crisis level of income for the 11-country group will be about nine years. By 2021, Greek and Italian per capita income will stand at about 14% and 9%, respectively, below their 2007 level. The Greek crisis, which is far from over, is tied for tenth place among the worst 100 historical crises. Even setting aside the more charged and controversial restructuring of sovereign debt, the write-off of private debt incurred during the boom (often under a very rosy set of assumptions about borrowers’ future income and wealth) has been an integral part of the resolution of banking crises through much of known history. Notable exceptions include the “evergreening” of bank loans through the years in the aftermath of Japan’s crisis in the early 1990s and Europe’s ongoing crisis, which is fast approaching the decade mark. The anemic recovery in many advanced economies (even when compared to other severe crises) owes much to the prevailing “extend and pretend” approach to debt. European banks since the crisis have largely been kept busy buying government debt and evergreening (in Ponzi-scheme fashion) private pre-crisis loans. As difficult as the foreclosure episode was in the US, it enabled borrowers and banks to adapt to the collapse of the housing bubble and to move on. Earlier episodes, ranging from the Scandinavian crises of the early 1990s to the Asian crisis of 1997-1998, produced a much faster pace of deleveraging. One can only hope that China’s approach to dealing with its internal private and sub-sovereign debt does not adhere to the Japanese-eurozone timetable.